Sharkara Upperi is an essential fried item served in Onam Sadya. The Nendran banana is deep fried and coated with the jaggery and flavoured with dry ginger powder or cardamom powder. 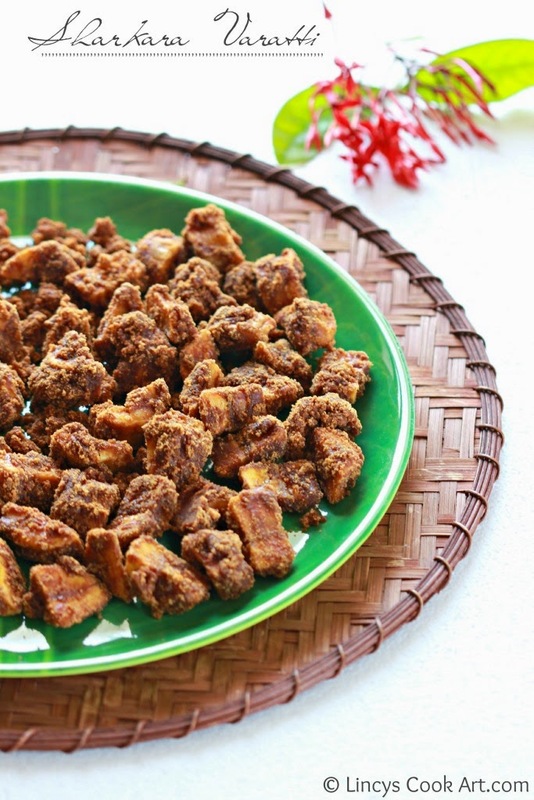 These Jaggery coated banana chips are so popular in our native place because Nendran bananas are one of the main cultivation. These sweet chips are crispy and tasty can be eaten as a snack item. Can be prepared easily in a jiffy. This could be prepared and stored for months for later use. Like Ethakka Upperi/ Banana Chips this is also an essential item for Onam Sadya. Take a big bowl full of water and add the turmeric powdre and mix well. Peel the nendran banana and immerse the banana inside the turmeric water to avoid browning. Cut the banana into two pieces lengthwise and chop into medium sized pieces for sarkara puratti. Heat oil in a pan and deep fry the banana pieces till crispy in low flame. It will take some time to become very crispy. It should fry very crispy till light golden colour. Otherwise once you keep the fried pieces inside the jaggery it becomes soggy. In case if your chips becomes soft once it cools down, again heat the oil and fry them till crisp. Take Jaggery and water in a pan and melt the jaggery. If your jaggery is not pure stain the jaggery water once to remove impurities. Add the dry ginger powder and the fried banana pieces into the sugar syrup and mix well. Sprinkle the rice flour over the mixture and coat well. Mix well to avoid sticking pieces. Once the mixture almost dry switch of the gas. Further it automatically becomes hard once it cool down so once it becomes hard scrap the pan to avoid sticking hardly inside the pan. Transfer the sarka varatti inside an airtight container. Note: You can use roasted rice flour instead finely powdered aval (Flaked rice). Looks like a good recipe, will try it and let you know. perfectly made,dear..I too made this the other day,love it!! !